Kalikasan PNE coordinator for Philippines Clemente Bautista and Camila Mendez from member group COSAJUCA, will travel to the heart of the mining industry – London – to challenge the Mines and Money conference. From the mining frontline, human rights defenders from Uganda, Philippines and Colombia are gathering in London to oppose the Mines and Money Conference taking place between 27-30 November. Over 2,000 mining company representatives, investors and ‘thought leaders’ like Arron Banks and Nigel Farage (1) will meet at the exclusive conference in London, the largest global hub for mining finance. Advertising itself as the place ‘where deals get done’, at Mines and Money, mining industry players will be shaking hands on deals to exploit new areas in response to emerging market opportunities, such as the global shift from a fossil fuels to a minerals and metals-based energy system. For all the industry’s efforts to present mining as sustainable, responsible and a driver of development, for communities living on mineral-rich lands around the world, these new deals mean displacement, destruction and death. Mining remains the world’s most deadly industry for those who oppose it (2). In a week of creative action, entitled Rise, Resist, Renew: Alternatives to Mines and Money, our speakers will be sharing alternatives to mining that prioritise the wellbeing of people and the planet, while opposing mining violence and extractivism in their communities. Alice Kazimura, Ugandan farmer, community leader and Chairperson of the Buliisa Women’s Development Association said: “Mining [oil extraction] in my community has led to involuntary displacement of people and land chunks of habitat destroyed with little or no mitigation or remedial action triggering negative environmental impacts on mother earth and people’s livelihoods”. Clemente Bautista Jr, national coordinator of Kalikasan People’s Network for the Environment (Kalikasan PNE) in the Philippines said: “It is important to expose the environmental crimes and human rights violations perpetuated by big mining corporations in our country. We know these companies are attending the corporate-sponsored Mines and Money Conference in London’. Camila Méndez, Colombian land and human rights defender and undergraduate student said: “Our movement defends water, territory and life in the small municipality of Cajamarca, which is recognized as a “breadbasket” of Colombia for its diverse and significant food production”. 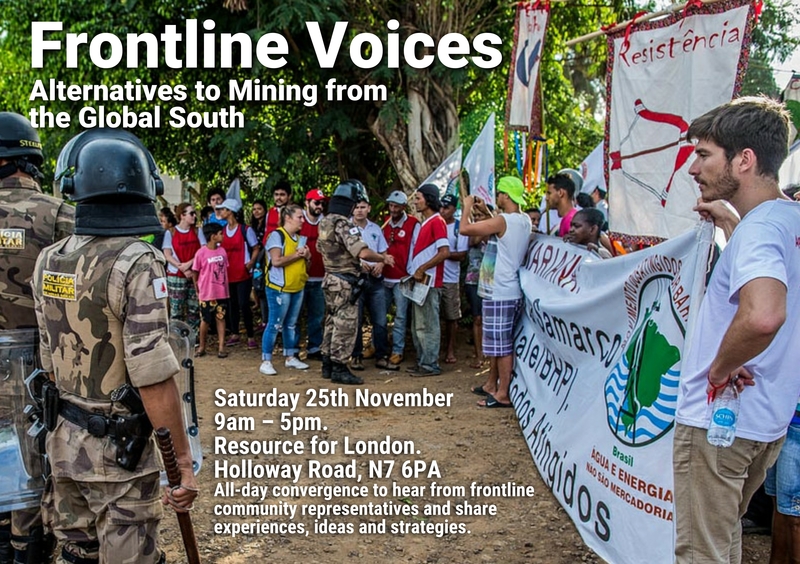 Hosted by: London Mining Network, War on Want, The Gaia Foundation, YLNM, Colombia Solidarity, Movimiento Jaguar Despierto. Mines and Money speakers include Nigel Farage and Arron Banks. Both Brexiters, Banks is co-owner of the Isle of Man-based Conister Bank. The Paradise Papers found that this bank opened a potentially high-risk account for a businessman in 2012, as reported by the Guardian. Banks is also under investigation by the Electoral Commission while they establish if he broke the law when he donated and loaned £8.4 million to the Brexit campaign, as reported by the Financial Times. In 2016, at least 33 environment and human rights defenders were killed while defending, land, water and livelihoods from imposed mining projects. More than were killed opposing any other industry, according to Global Witness.